Dorn Cox manages Tuckaway Farm, his family’s 250 acre multi-generational diversified organic operation in Lee, NH. He is also a PhD Candidate at the University of New Hampshire, and director of GreenStart, an educational non-profit organization set up to foster a resilient food and energy system in New Hampshire by providing technical education and practical agricultural examples. Dorn discovered that the Cornell Soil Health Test was available in 2009, while discussing soil testing with Brandon Smith, State Agronomist of the NH NRCS. “It was a good fit for GreenStart’s mission and I was excited, because the test not only incorporated biological, physical, and chemical indicators, but it also presented an approach for land management planning and adaptive management.“ In the spring of 2010 he submitted his first samples. A collaborative project was initiated among partners at NH NRCS, Cornell, Greenstart, NH Conservation Districts, and NH farms in four counties. The goal was to develop a framework for a soil health test-informed Soil Health Management Plan (SHMP), analogous with the NRCS’s Nutrient Management Plan, but with biological and physical test results to be considered, in addition to standard soil test results. Additionally the project set out to build local equipment infrastructure to enable soil health management through education and equipment rentals, and to demonstrate implementing these plans. Tuckaway Farm became the first test case for the new planning and implementation framework. Through the particular resource concerns identified, this case became strong evidence for the need to move beyond Nutrient Management Planning, to Soil Health Management Planning. Implementation of a targeted set of soil health management practices has now resolved eutrophication problems that had made the farm irrigation pond unusable for recreation since 2009. Soil health constraints beyond nutrient deficiencies and excesses currently limit agroecosystem sustainability, resilience to drought and extreme rainfall, and progress in soil and water conservation. The Cornell Soil Health Assessment (http://soilhealth.cals.cornell.edu/), makes it possible to identify and explicitly manage constraints. Available to the public on a fee-for-service basis since 2006, it provides field-specific information on constraints in biological and physical processes, in addition to standard nutrient analysis. A detailed listing of management suggestions specific to each indicator showing constrained soil functioning, and relevant NRCS cost-shared practices that could be applied to address the resource concerns identified through a soil health assessment. 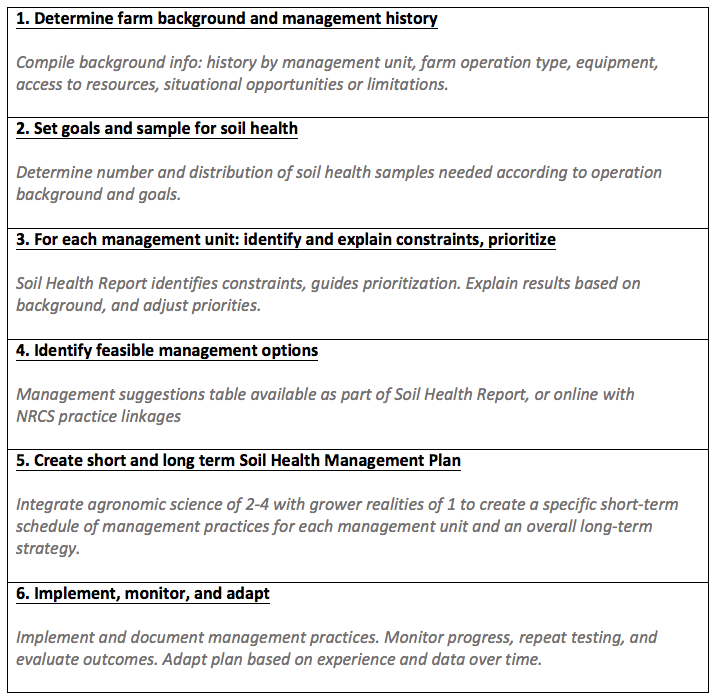 A new Cornell Soil Health Assessment report format that more explicitly provides initial interpretation, prioritization, and management suggestions, from which a SHMP can then be developed. Six general steps for the planning and implementation process (Figure 1). A pilot SHMP template for such plans that includes purpose, site information, assessment results and interpretation, and planned practices via a multi-year management calendar outlining a specific plan for each field. We developed a pilot multi-field SHMP using this framework at Tuckaway Farm, owned and operated by the Cox family for over 30 years, and at 17 additional NH operations. The purpose of this case study is to share the outcomes achieved in one of Tuckaway Farm’s fields, and suggests, based on this example, that a broader soil health assessment-based planning approach is necessary to maintain our nation’s most vital resource: our soil. Dorn and his father Chuck tell the story of a 30 year evolving family endeavor. Much of the land has been in long-term continuous organic hay for off-farm sales, with limited use of inputs such as wood ash and horse manure. The farm has added vegetable rotations and fruit over the years, and more recently dairy, eggs, meat, grains, and oils, among other products, all with organic certification. A Comprehensive Nutrient Management Plan determined that net nutrient exports off the farm were causing nutrient deficiencies in many long-term hay fields. The land base can potentially sustain a much larger number of animals. Management change has sped up since about 2009, with additional products being developed, experimentation with reduced tillage, cover crops, and rotational grazing, and a decrease in hay export as the younger generation farmers are building animal-based enterprises. Diverse equipment, owned by the farm, Greenstart, and the county conservation district, is available. The Pond Field, the subject of this case study, is a long-term hay field, occasionally grazed outside of the CNMP-required buffer strip around the pond’s perimeter. The field’s soil is an inherently well-drained but easily eroded Hollis-Gloucester fine sandy loam of mostly 8-15% slope that levels near the pond at the bottom of the slope. Forage growth was mediocre, and legume content was very low, when the field was assessed for the project in spring of 2012. Dorn Cox noted that the pond had previously served as their swimming pond. It had become overgrown with algae since 2009, indicating excess phosphorus availability in the water (Figure 2), despite the fact that manure-spreading buffers were attended to in accordance with their CNMP. Goals for the farm included improving soil health, productivity, on-farm nutrient and carbon cycling, and long-term sustainability, and regaining use of the pond for recreational purposes. A number of representative fields on the farm were sampled to assess baseline status and to guide changes in management as the enterprises evolve. Overall, soil health at Tuckaway Farm was found to be medium to high, with generally high total organic matter and aggregate stability due to low tillage and long-term perennial forage growth. However, compaction was a prominent soil constraint. 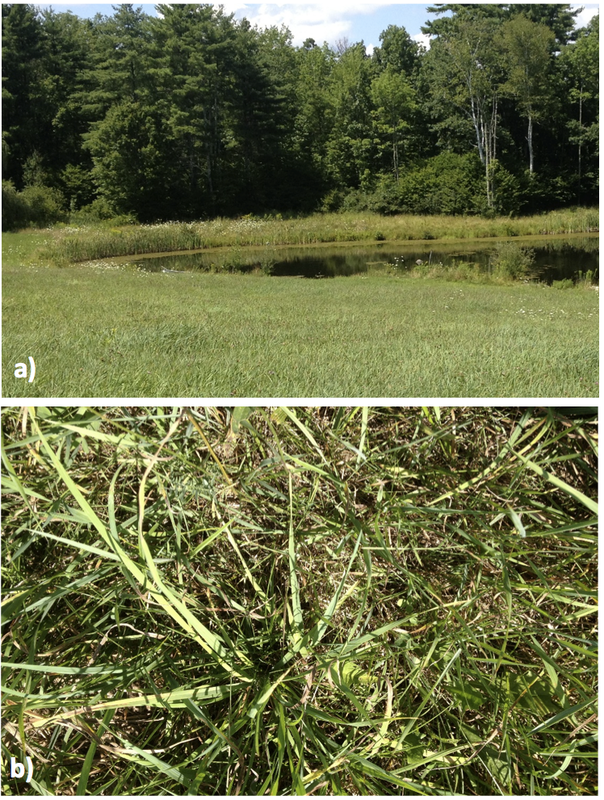 Severe surface compaction and suboptimal subsurface hardness were identified as factors driving decreased soil functioning and low current plant vigor in Pond Field (Figure 3), likely due to traffic on wet soils during haying and grazing. Active carbon was suboptimal or constraining in every field, likely resulting from low plant vigor and thus low fresh root and shoot contributions to soil organic matter. P, K and pH were suboptimal in many fields, including Pond Field, further contributing to low plant vigor and low legume content. 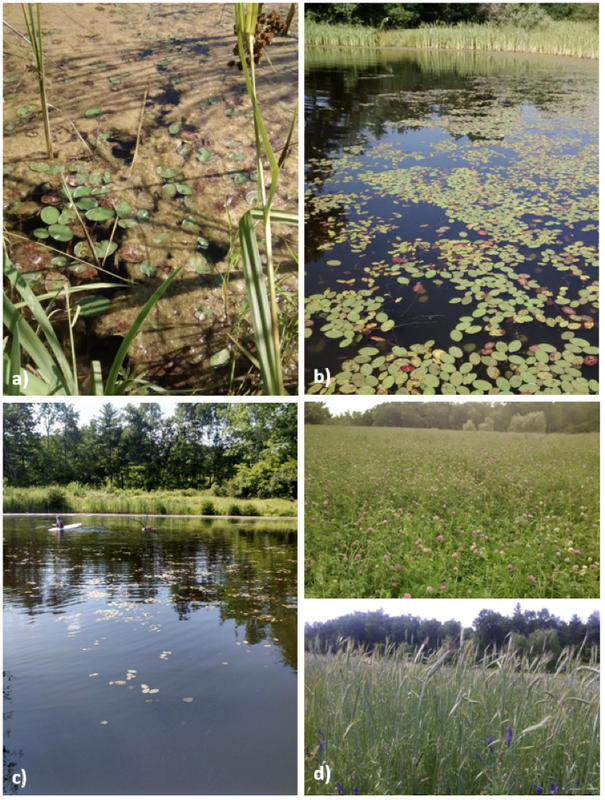 Eutrophication problems from excessive P inputs into the pond were thus clearly not due to high soil P. Rather eutrophication was explained by poor physical and biological soil health. Severe compaction on a grazed slope with suboptimal vegetation growth was causing excessive runoff during rain events, and thus water quality problems. Figure 3. 2012 Cornell Soil Health Assessment for Pond Field shows that compaction drives the lack of soil functioning observed for this field, with suboptimal nutrient and pH conditions contributing to poor plant growth, which in turn explains suboptimal active carbon availability. Surface and deep targeted soil disturbance were identified as feasible and most promising options (see table of management suggestions) for alleviating compaction. Improved selection of cover and pasture crop species was considered secondary for this constraint, based on low vigor and the need to jump-start the system through initial loosening of the soil, but these selections were deemed essential for improving and maintaining biological activity in the longer term. Woodash and manure were identified as the most feasible immediate ways to address nutrient and biological activity constraints. It was noted that bedrock for the soil type is generally at 10-20”, so that improving water dynamics and preventing erosion was particularly important, but that bedrock proximity might cause challenges for mechanical compaction management in some areas. Deep ripping with the available Yeoman’s plow along slope contours (30” spacing, to maximum depth possible considering bedrock), to alleviate subsoil compaction, low infiltration, and erosion issues. Interseeding tillage radish or similar deep rooted fall brassica in order to keep soil pores open, implemented in the same pass as the above if feasible. Woodash application followed by aerway incorporation to address suboptimal K, P, and pH, along with surface compaction. A combination of rotational grazing or haying during appropriate soil moisture conditions was recommended. Grazing was to be followed with aerway incorporation of manure to increase soil P and decrease chances of erosion. Interseeding of additional species, such as warm season annual forages (sorghum sudangrass or forage soybean) during 2013 was planned to increase biomass production and thus biological activity. Monitoring compaction levels and possible follow-up with further mechanical alleviation was planned for subsequent years. Implemented Practices: The plan was implemented with some adaptations due to farm scheduling, weather constraints and equipment availability (Figure 4). Yeoman’s plow and aerway with one hole offset were used according to plan, but no woodash was applied, nor were additional crops interseeded in the fall of 2012. The three shank yeoman’s plow was set to 20” depth and 30” spacing between shanks, followed by the aerway with one-hole offset on the same day. All grazing was stopped on the slopes above the pond starting in 2012. Two cuts of dry hay were taken during the summer of 2013. The wet 2013 spring delayed woodash delivery and spreading until after the second cut hay was removed, and the spreader was available for covering multiple fields. Woodash was surface spread in October 2013 using the conservation district’s Stolzfus wet lime and woodash spreader loan program. The slope above the pond was then seeded to a hairy vetch, winter rye, wheat, barley mix in a single pass cultivation using a Unimog U1200 tractor with a front mounted Howard rotovator set to 3”, and rear mounted Great Plains no-till drill. The mix was planted to address surface compaction for improved infiltration, as well as to produce one of multiple potential crops depending on needs at harvest: feed grain, cover crop seed (usable as on-farm custom winter mix, or separable with the farm’s spiral separator), or a single cut of legume mix dry hay harvestable in late August of 2014. Observed Results: Prior to implementation in 2012, significant runoff was evident during rain events. Algal growth (Figure 5a) prevented use for recreational purposes. Water flow from the slope during rainfall was noticeably reduced after deep rip and aerway treatments, despite the wet 2013 spring, and the pond started to clear and became usable for recreation in 2013. Runoff reduction appeared even greater post grain-vetch-mix planting in the fall of 2013, and the pond’s water quality continued to improve into the 2014 summer season (Figure 5b, 5c). The effect of wood ash was evident in the spring of 2014 as vigorous clover growth returned to the field, and the grain-vetch mix grew with satisfactory vigor (Figure 5d). 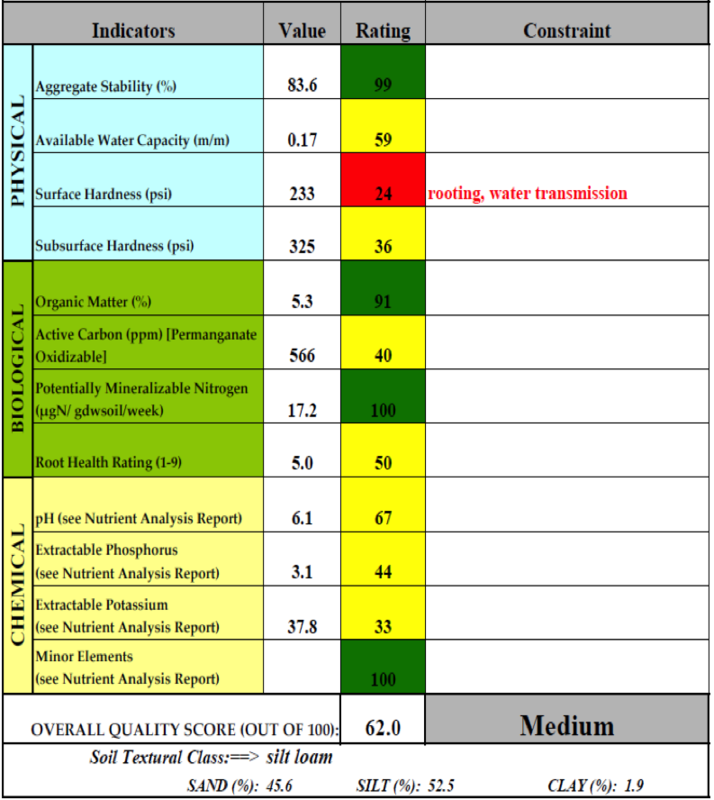 Progress in crop productivity and pond water quality will be monitored further. 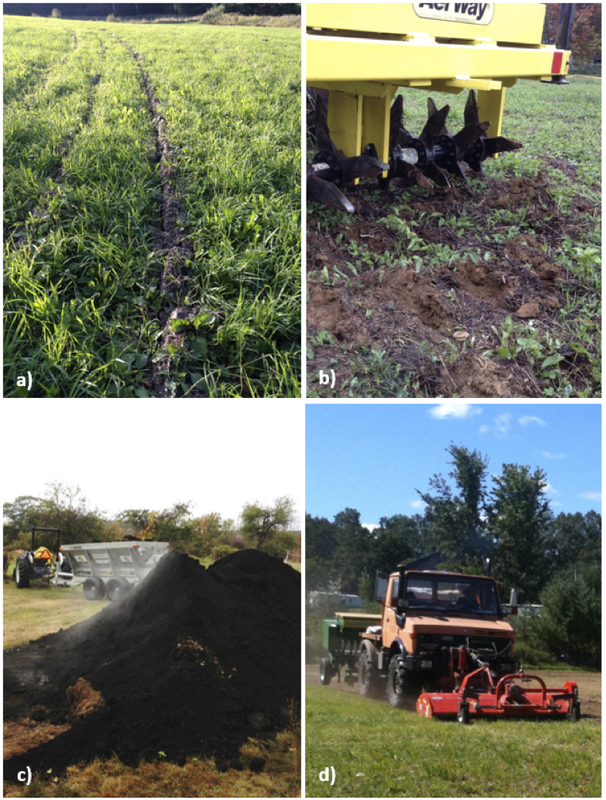 In this case-study, a targeted set of soil health management practices were implemented to alleviate previously unidentified compaction, in addition to interacting minor biological and chemical constraints. These treatments have resolved eutrophication problems in a pond that can now again be used for recreation. This case demonstrates strong evidence for the need to move beyond simple Nutrient Management Planning, to more comprehensive Soil Health Management Planning. We illustrate interactions between nutrient-related constraints and biological and physical limitations in soil conditions: in this case the lack of infiltration from compaction and poor rooting allow for simultaneous occurrence of nutrient deficiencies in soil and nutrient excesses in water. We further illustrate the limitations of applying prescribed best management practices (e.g. buffers), as opposed to using environmental monitoring and systems indicators to provide feedback for adaptive nutrient management. Biological and physical constraints must be explicitly identified through soil health assessment, and managed comprehensively alongside nutrient-related constraints. Management must be adapted in response to seasonal conditions and observations, in order to achieve satisfactory progress in soil and water conservation. We would like to acknowledge funding received from a NH NRCS Conservation Innovation Grant, a Specialty Crops Block Grant, from the NH Charitable Foundation, and from NY Hatch, which enabled completion of this project. We would also like to acknowledge the collaboration of NH NRCS and Soil and Water Conservation District staff, and of additional NH growers, who helped inform the development through their participation in the planning process and contribution of diverse farm scenarios to test the flexibility of the framework.